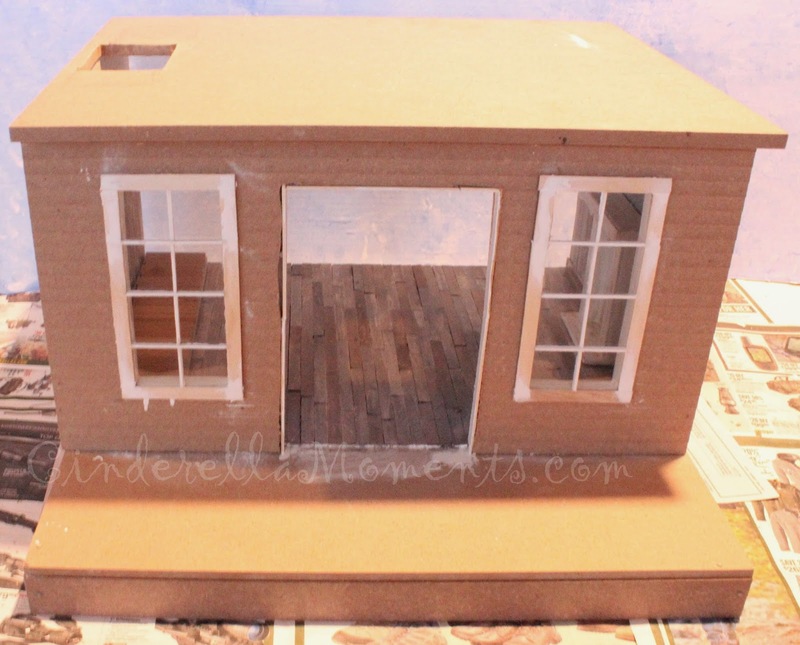 I'm working on a new 1/12 scale dollhouse. This one is a french mansard roof style. So far the interior is getting done. First, the wood floor went in. They are Popsicle sticks. They got a coat of a mix of brown and a tiny bit of black which was watered down so you can still see the wood grain. 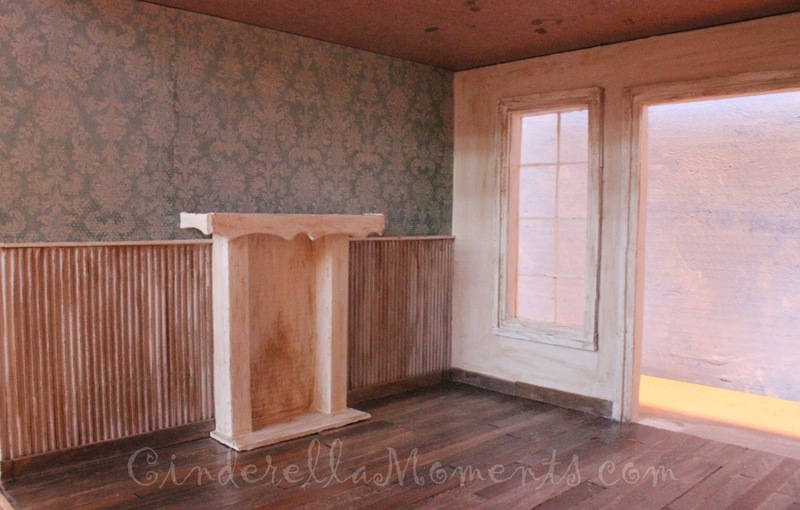 Then the plaster and wallpaper were applied. Next, the wainscoting and trim were glued in place. The Wainscoting is a cardboard that's ridged. It can be found in the scrapbook section of your craft store. The mantel is scraps of wood. The windows are trimmed with Popsicle sticks. The window panes are also Popsicle sticks cut horizontally into thin strips. I'm putting stairs in this one. Under the stairs I'll put a stove/range. There will be a table and some chairs too. The upstairs will have a bedroom and a studio I think. This is the front. I want to make sure I show you these houses in their beginnings sometimes. They do all start out looking like not much at all. So when you get to this stage don't get scared off. It will look great in the end. 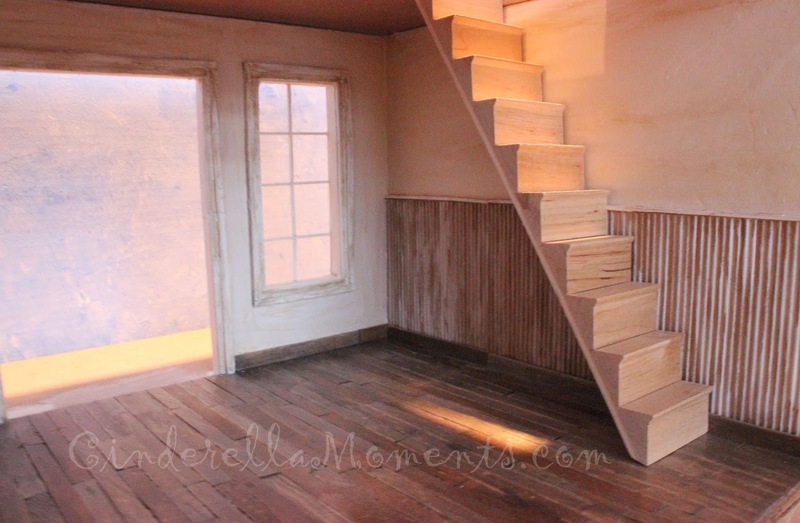 This house is made of MDF. So it is pretty heavy. I cut out my doors and windows with my Dremel Trio saw. It does the job. But I wish I could find a more precise saw. Until next time! I think I recognize this little house as I have justs finished mine as a ballet studio. 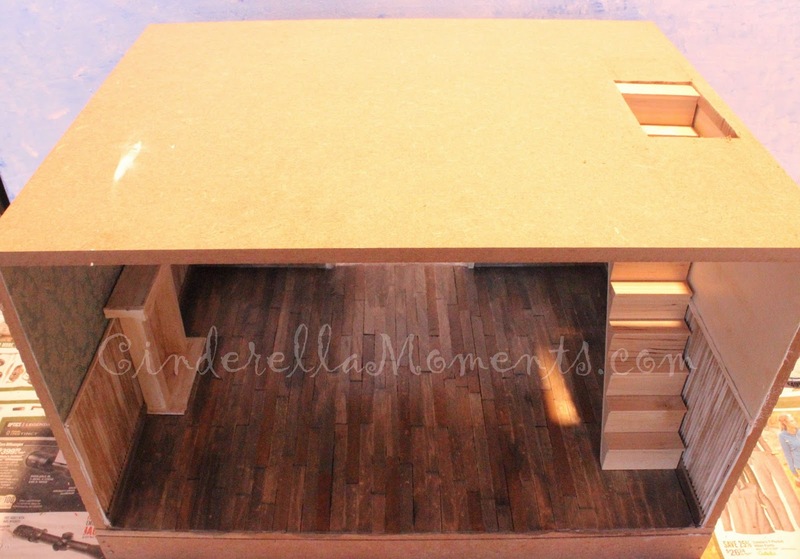 The MDF is very easy to work with except for the squaring of the windows. Did you make the door wider? I can't wait to see what you do with yours. Great tutorial and the beginning of your house she is beautiful! wow !, you have a special art, Caroline !. 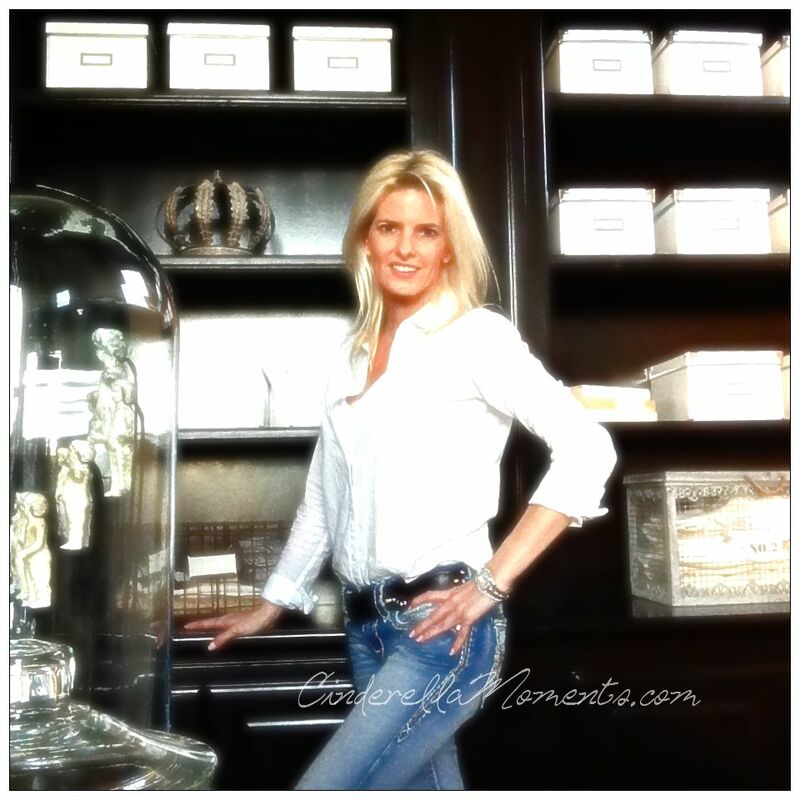 each of your beautiful homes is a great work of art. when decorate will be awesome! It's going to be a nice house. I expect this one will be beautiful...as they all are, Caroline! My goodness! You are so productive. Love this so far. Your floor is super. The idea of adding a watered down black looks fantastic. Looking forward to seeing the progress on this beauty. Me gustan mucho los comienzos de tu nueva casa,el suelo se ve precioso,combina y contrasta con las paredes,seguiré tus avances!!! Oh... I think that this is going to be Very Pretty and I am really looking forward to seeing how this develops. I LOVE Mansard roofs! I'm amazed at how quickly you work! Great beginnings. I can truly appreciate your workmanship. My dollhouse is about to be the death of me! I still have one room left to do and finish up the staircase. The work has gone so slow and nothing is square in this 40 year old dollhouse. I get frustrated because I want it to look better, but finally decided that perfectionism will not get me to what I want - to play with all the finishing touches! Thanks for all your tips. I'm soaking them up!!! Another dollhouse ....again, wow, you're a speedy worker ;O?! But I love those special mansard roofs, because the space under this roofs have such a special atmosphere. Caroline, I'm curious what you will do with yours! 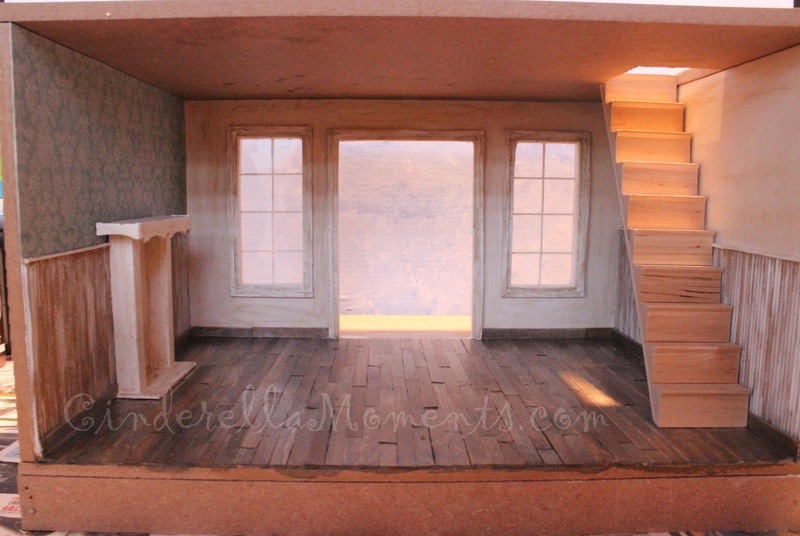 Wonderful start and I can't wait to see what you will do with this kind of dollhouse :D! I love that you are showing it as its starting the build and using high quality imagination to make it. Some people are so afraid to jump in there and create because they get hung up on having to buy the required packs of ...blah blah.. Your a great inspiration to show this now and then the transformation your builds make into the stunning builds they are! The floor looks fantastic. I cant wait to feast my eyes on more of this gorgeous house. I can´t wait to see more !! It's always such a pleasure watching you create these little houses. I can't wait to see what it looks like done.